Between the big battles, like we saw at X47L-Q last week, there are thousands of smaller ops that undock to take care of business and look for fun and targets of opportunity. Saturday night saw Asher Elias, the sky marshal who has been running huge multi-fleet operations with hundreds of super carriers and titans following his orders, able to return to smaller fleet ops as Reavers formed up Ishtars and undocked. He has business for us to attend to and we headed to X47L-Q. There the first thing we did on entering the system was warp to a cyno on the NCDot Keepstar and pop the ship running it. Sitting exposed right on the hostile structure, we quickly turned about and warped off, then headed back to a point on grid with it again. We had a couple of things on our plate. One was a matter of expedience. While we were there and able to fly cover, a call went out to cap pilots who might still be stuck logged off on grid after last week’s battle letting them know that they had an opportunity to log in and jump out of system. A few pilots too advantage of the opportunity. However, our main task was to cover a new structure being dropped in the system. 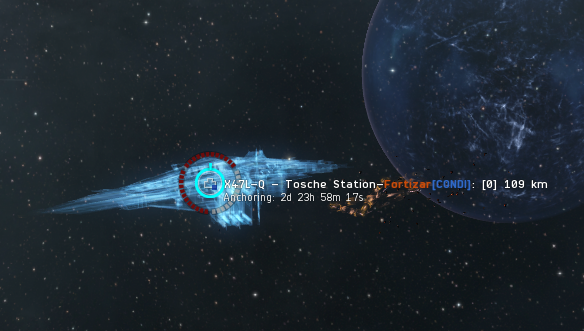 A Fortizar named Tosche Station was dropped and we were there to watch it for the 15 minute deployment timer, during which it was vulnerable to attack. This was part of the change to Upwell structures that went in last last year. They are now vulnerable for 15 minutes when first dropped and then for 15 minutes at the end of their anchoring sequence. During that time they are both easy to shoot, as they are unfitted and cannot shoot back, and can be destroyed in a single fight. However, save for a single Pandemic Horde Cormorant, none of the locals sought to interfere with the structure during that vulnerable time. The structure made it through and began to anchor. It was good for three days, after which it would be vulnerable again before coming online. 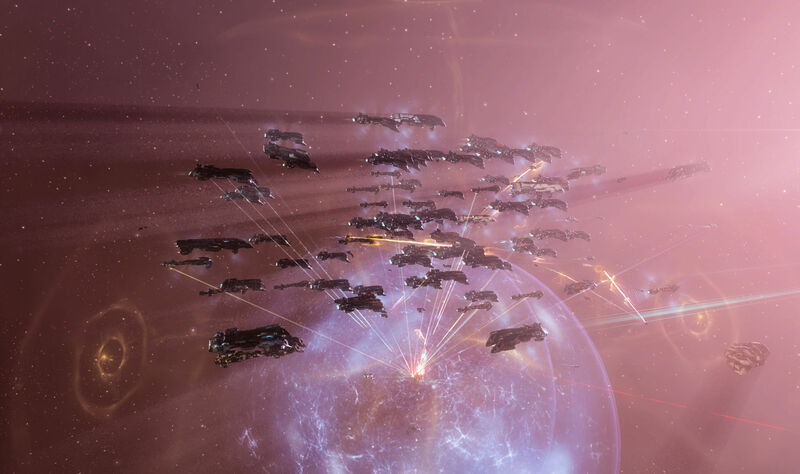 We shall see if the locals care to form up to keep it from going online to keep us from having a structure on grid with their Keepstar before the final fight for that kicks off. After that Asher had us head out for another destination in a hurry. We flew into Tribute, home of NCDot and Pandemic Legion, and through systems I remember both from living there are from the battles in them over the years, to M-OEE8. There tackle had run ahead and pinned down some targets for us. 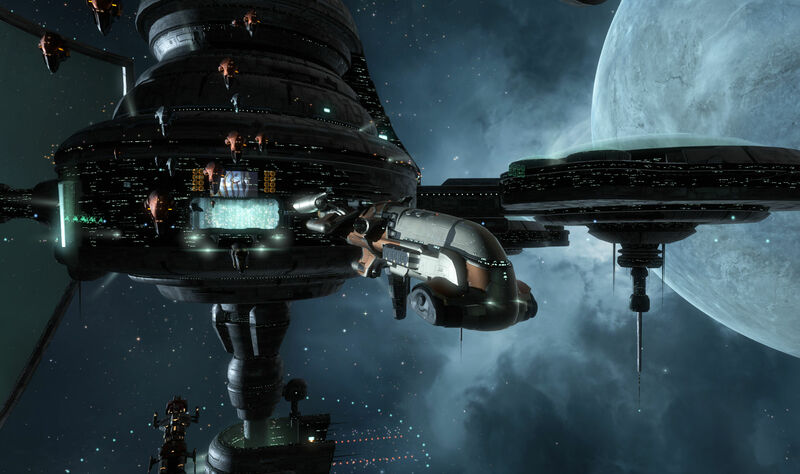 Arriving on grid we found two dreadnoughts, a Phoenix and a Revelation, as well as two Rorquals. We went after the Phoenix first. Even as we got there one of the Rorquals had already set off its defensive PANIC module, a protective bubble meant to keep the ship alive for a while in order to let help form up and rescue it, before we had had the opportunity to shoot it. The Phoenix went down, and then the Revelation, before we were able to get started on the more expensive Rorquals. By that point the PANIC module had run down on the first one while the second one put its up after we poked it a bit. 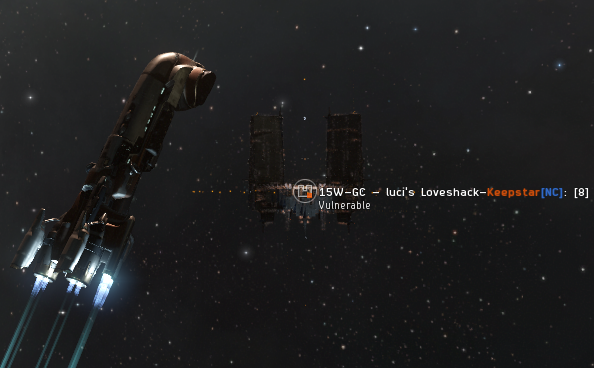 After that, we raced off to M-OEE8, a system of legend and PL’s capital, complete with Keepstar. During this some hostile interceptors showed up with a mind to rescue the remaining trapped caps, but they did not fare too well. On warping in we were able to divert drones to them, killing a few as the others warped off. After a couple runs at that they kept their distance, waiting for a target of opportunity. When the first Rorqual was dispatched we motored over to the second and setup around it waiting for its PANIC bubble to fade. When it went down we started in, but then were told to pull drones. Jay Amazingness Thomas Lear had a Baltec fleet in the area and Asher wanted to let them come over to join in on the kill. 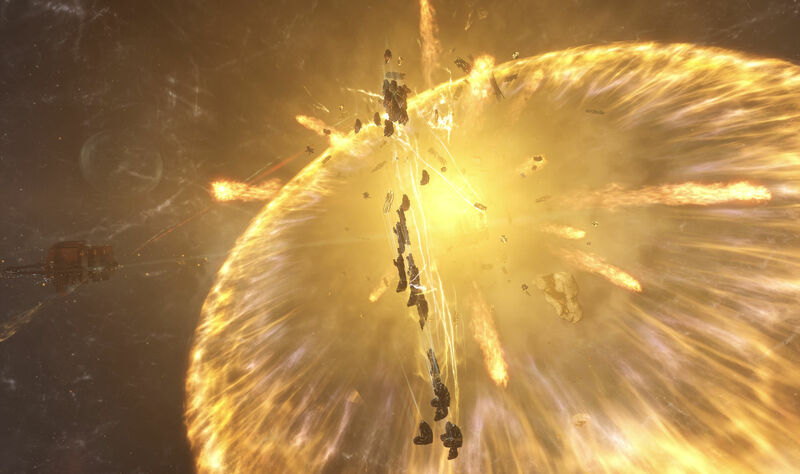 That additional firepower made short work of the Rorqual and it exploded in the dramatic fashion to which we have become accustomed. All four of the capitals were in Rate My Ticks (ticker: WERMT), which is Pandemic Legion’s rental alliance. Both PL and NCDot still generate income by renting space as their other sources of passive income have dried up. We then cleaned up the deployed warp disruption bubbles that they had laid about to keep people from warping directly to them from the gates and then started to head back towards home, past more structures. As we and the Baltec fleet moved back towards Pure Blind we were shadowed by the hostile interceptor fleet, which was waiting for a straggler or somebody who didn’t align so they could pick them off, as well as flashes of time dilation. Pushing a couple of fleets through an otherwise quiet region is enough to tax a server that otherwise hasn’t been reinforced. 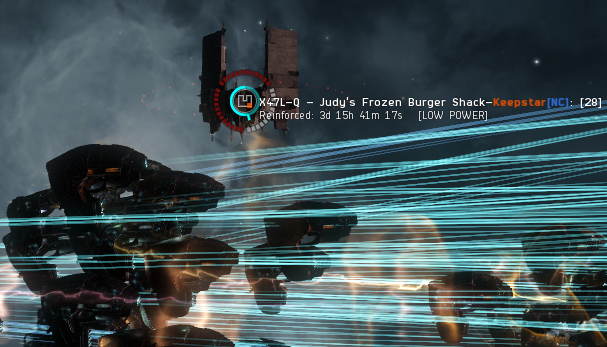 On the way back we stopped again in X47L-Q in order to clear off some drag bubbles from a POS that was setup as a trap. We were able to clear the bubbles, though the affair kept the logi wing busy as the tower shot at people, constantly switching targets. Extricating ourselves from the tower was a task in and of itself, as the warp disruption batteries kept hitting people as we aligned to warp out. Asher asked if anybody was pointed before he warped, the heard an affirmative only after he had warped us, so we turned around and headed back to try and rescue those caught. We lost an Ishtar that way before we finally got off grid. We also lost the fleet Impairor. One person who logged on to go with the fleet didn’t have anything handy besides a rookie corvette, so brought that along for the fleet. It made it through, getting on all the capital kill mails. However, it got blown up at the POS tower, though the kill mail shows that the pilot took the effort to fit it up to be useful. Tackle corvette! After that we headed back to our staging and stood down. Not a bad fleet at all. It is nice to get back into the smaller ops that Reavers do. 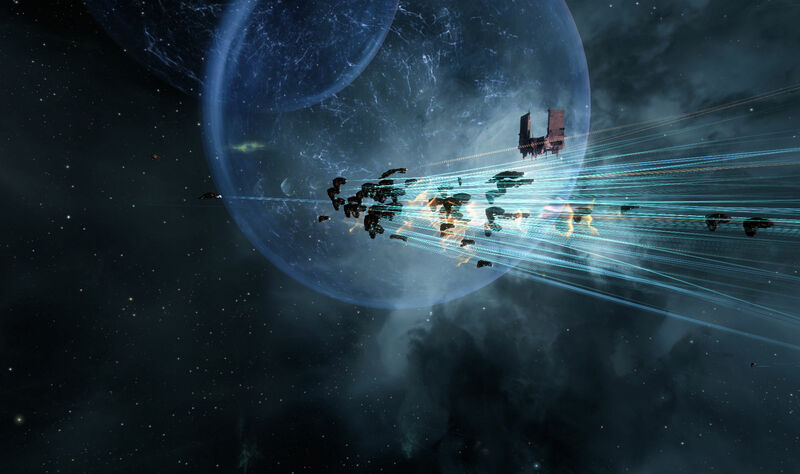 Asher said on The Open Comms show last Friday that our whole SIGs and squads campaign in the north owes its origin to Bigbilltheboss who, after the Hakonen deployment didn’t want to bring all his dreadnoughts back home to Delve. (We came back from that about a year ago at this point.) So setup shop to drop on the locals ratting and mining and found the fields to be rich in targets. Then we, and BlackOps, and TNT, and Space Violence all ended up in the north, where we have been deployed since at least November. A long and fruitful deployment it has been too, with a lot of small fleet actions. But more big ops are coming. 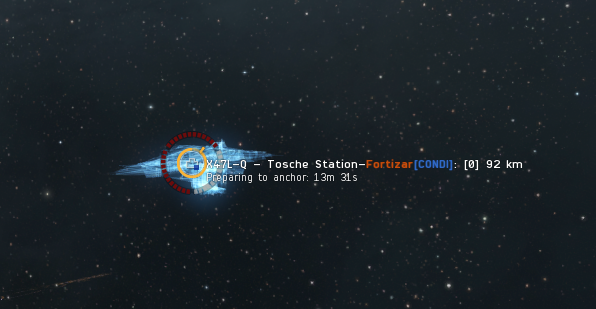 We will have the Fortizar to defend on Tuesday and then the final timer for the NCDot Keepstar on Wednesday. 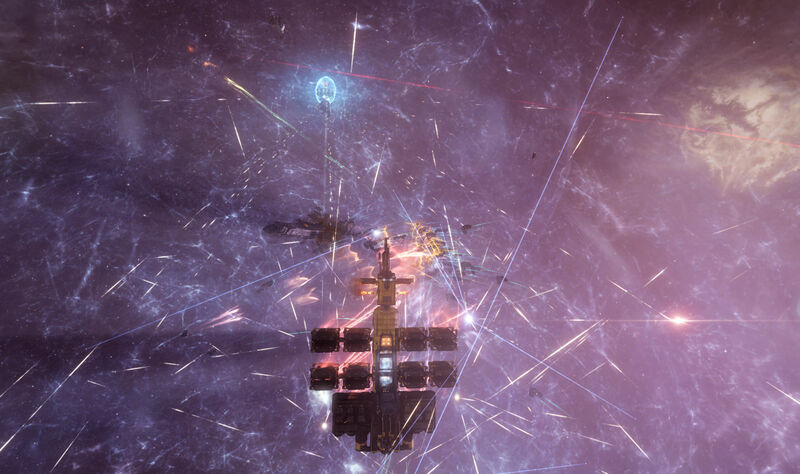 Expect CCP’s servers to be heavily taxed once again as we see if more titans die. 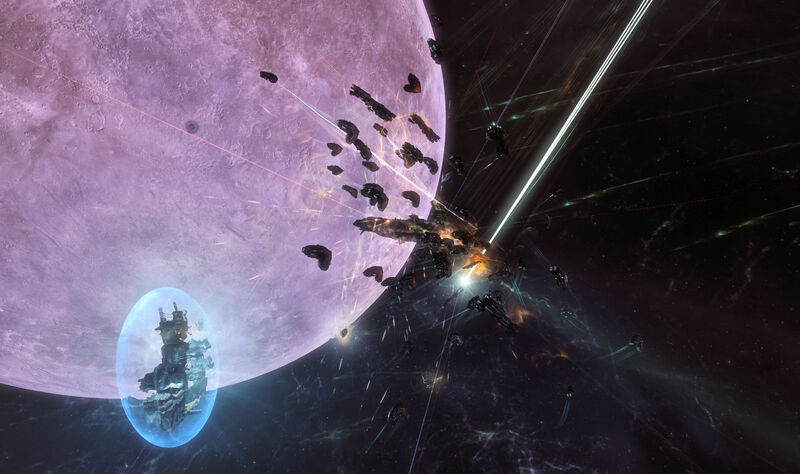 This entry was posted in entertainment, EVE Online, Null Sec and tagged Asher Elias, M-OEE8, Rate My Ticks, Reavers, Tosche Station, X47L-Q on August 6, 2018 by Wilhelm Arcturus.